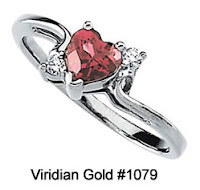 Now you can get beautiful Promise Rings at Viridian Gold! Guys have always wanted to give their girlfriends some piece of jewelry to show their commitment to the relationship. And, when the couple is ready to take the Big Step, that event is traditionally accomplished with a diamond engagement ring. But what about a relationship that isn't quite to that point yet? Well, that is where the promise ring comes in, and more often than not, it is a diamond promise ring. We have recently added a collection of Diamond Promise Rings to our website to help you find that special, beautiful ring which says "I Promise!" 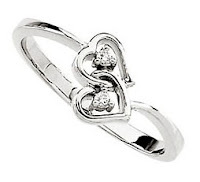 A great example is the popular 14K White Gold Intertwined Hearts Diamond Promise Ring #1303 shown here. It's affordable, too, because we understand that this purchase is just not the same magnitude as an engagement ring would be! The diamonds in our rings, by the way, are not cheap, "dirty diamonds" that you find in department store jewelry. These are quality, white, good clarity stones that are worthy of a ring that is given as a promise! We always specify the diamond quality for our jewelry items, so you will always know what you are paying for! Not all of our promise rings are diamonds-only, though. We also offer several gemstone-only, and gemstone-diamond rings, for example our 14K White Gold Heart-Shaped Garnet & Diamond Promise Ring, #1079 shown here, and it's companion, the Heart-Shaped Pink Tourmaline & Diamond Promise Ring, #1078 in 14K Yellow Gold. All of our gemstone rings are fitted with genuine gemstones, not imitation or colored glass. And, almost all of our rings can be customized with alternate gemstones of your choice, so be sure to call us if you would like to substitute another stone! Check out our new military jewelry!